It’s a great budget booster. It’s a painless and tasty way to enjoy good-for-you veggies. It can be an on-the-go-meal. It can be the catalyst to gathering friends and family to the table. It’s a super gift for that ill neighbor, busy mom, new move-in, and so on. And a basic soup recipe is the springboard for creativity. Season to taste, switch out one veggie for another, or bulk it all up with rice, potatoes, or pasta. And who doesn’t find soup-making a supremely satisfying endeavor? Don’t you think putting a pot of soup together is therapeutic? Those questions asked, this information is for all the avid soup makers out there. 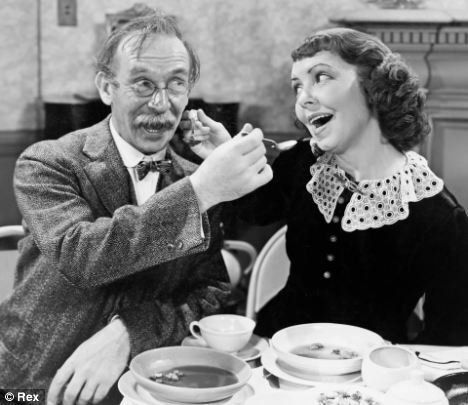 These “AH HA!” tips for savvy soup making come from one of my favorite cookbooks, Soup’s On, by the former food editor of one of Utah’s major newspapers. Valerie Phillips spent decades testing and creating recipes as part of her job and she knows her stuff. First let me say, though, that I know that so many of our Cook’n readers are skilled and experienced cooks. So some of you may find these suggestions elementary. But do keep reading in case you run on to something you haven’t thought of or tried before. And of course, you pros can feel free to pass this advice on to those newer cooks you’re acquainted with. That said, it’s the newbies that I am actually dedicating this to. 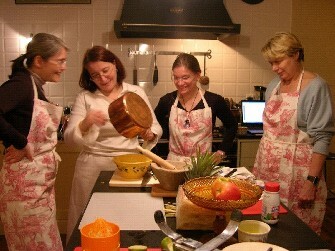 We experienced soup-makers want others to catch our love of this terrific cooking adventure, right? So first, gather your ingredients and equipment together. Cooking is more fun and efficient when you’ve got everything you need at hand. Next, combine cooking tasks. If you can, use just one pan instead of several, for instance. Consider tortellini soup as an example: Recipes always have you boil the tortellini in water then drain and add it to a soup. Why not just cook the tortellini in the soup to begin with? And, take advantage of simmer time. Most recipes assume that you’ll prep all the meats and peel and chop all the veggies before you even turn on the stove. This adds precious minutes to your total cook time. 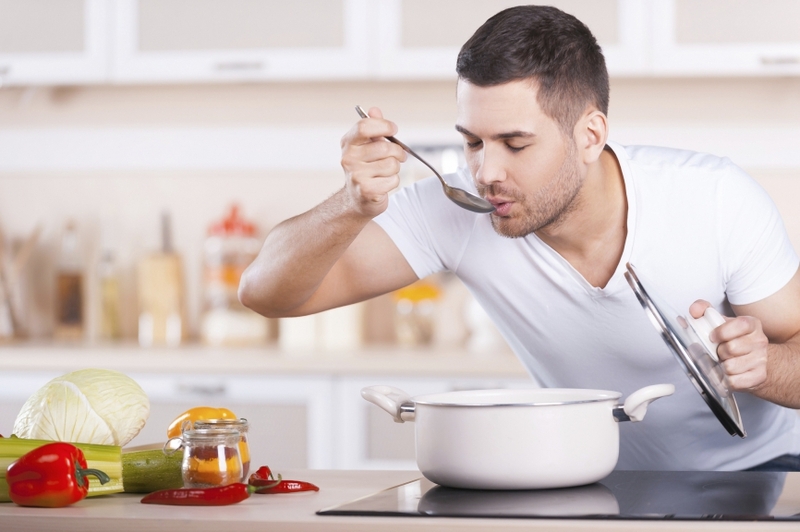 Why not start your long-cooking ingredients simmering on the stove first; then, while you’re waiting, chop or shred some of the short-cooking ingredients? Try to capitalize on any waiting time by sandwiching tasks in between. Also, save time by preheating. Get in the habit of warming the cooking oil over low heat while you prep other ingredients then turning up the heat when you’re ready to sauté. This saves a few minutes of heating time. And the vegetables don’t get overcooked as they’re sitting in the oil, waiting for it to come up to temperature. Be smart and careful when pureeing. Many soups are pureed for a smooth texture. Immersion blenders are so good for this and you can puree right in the pot. Tip the pot to one side to collect the soup and make sure the blender blades are fully submerged before turning it on, otherwise soup will fly. If using a stand blender, fill it only one-half to two-thirds full so there’s ample room for any backsplash. And if the soup is really hot, leave the hole in the blender lid open so steam can escape. With these tips under our belts, let’s apply them to one of our favorite recipes from Soup’s On. 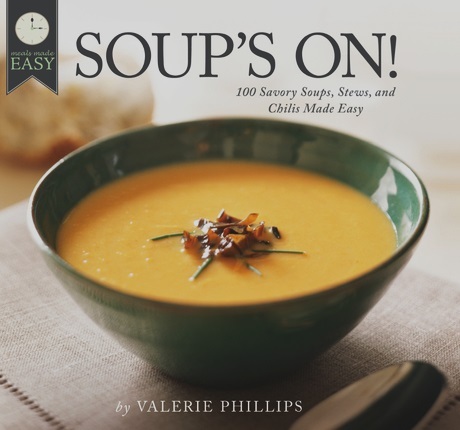 We thank Valerie Phillips for this amazing soup that I bet you’re all (pros and novices) gonna love! Place broth in a 4-to-6-quart stockpot over high heat. Add rice and bring to a gentle boil. Meanwhile, remove chicken from carcass of rotisserie chicken (or use your leftovers or frozen chicken pieces). Cut it into 1-inch pieces and add to the pot. As rice cooks, add onion, garlic powder, cumin, tomatoes, corn, black beans, 3 tablespoons cilantro, lime juice, and sugar. Cook for about 15 minutes, until rice is tender. If soup becomes too thick, thin with a little water or more chicken broth. 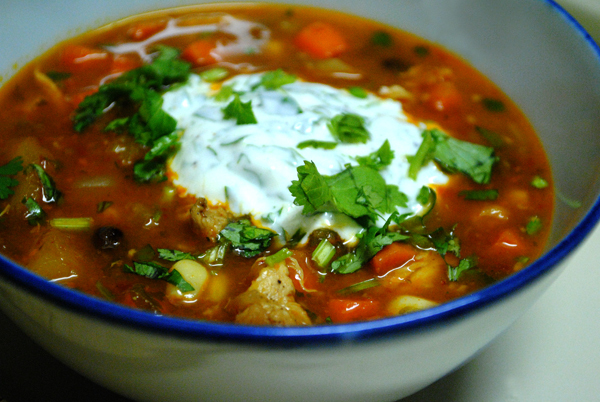 Serve with generous sprinkles of remaining cilantro, cheddar cheese, sour cream, olives, and so on.